If you are looking for a weekend breakfast to set you up for a long hike or a tromp across the countryside, this is the one that will get you all the way to lunch. 1. Heat 1 tablespoon of the oil in a large frying pan set over a medium heat. 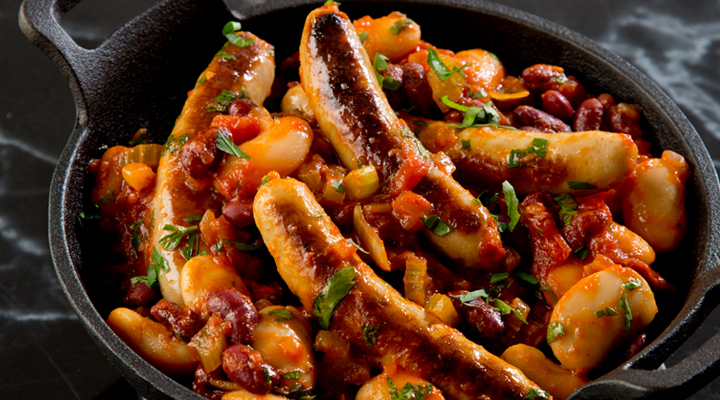 Add the sausages and fry for 8 to 10 minutes, turning frequently, until golden brown and fully cooked. Set aside. 2. Reduce the heat and add the remaining tablespoon of oil to the pan if needed. Add the onion and celery and fry for 3 to 4 minutes, until softened. Add the garlic and cook for a further 2 minutes. Add the spices to the pan and stir to coat the onion. Pour the chopped tomatoes into the pan along with the chicken stock and tomato purée and stir to combine. Allow to simmer for 15 minutes, until slightly reduced. 3. Add the beans to the pan along with the sausages. Cook for a further 5 minutes, until heated through. Season with salt and pepper. 4. When the casserole is almost ready to serve, place a griddle pan over a high heat. Brush the sourdough on each side with olive oil and put two slices on the pan. Cook for 2 minutes on each side, until nicely browned, then flip over and cook for a further 2 minutes. Repeat with the remaining two slices. 5. Divide the casserole between four warmed plates and serve the toasted bread on the side. Sprinkle over the chopped parsley and serve.